MANILA, Philippines – The Cleveland Cavaliers spearheaded by Ohio’s basketball prodigal son and 4-time MVP Lebron James had to wait couple of days more and watched the Golden State Warriors edged the Houston Rockets. 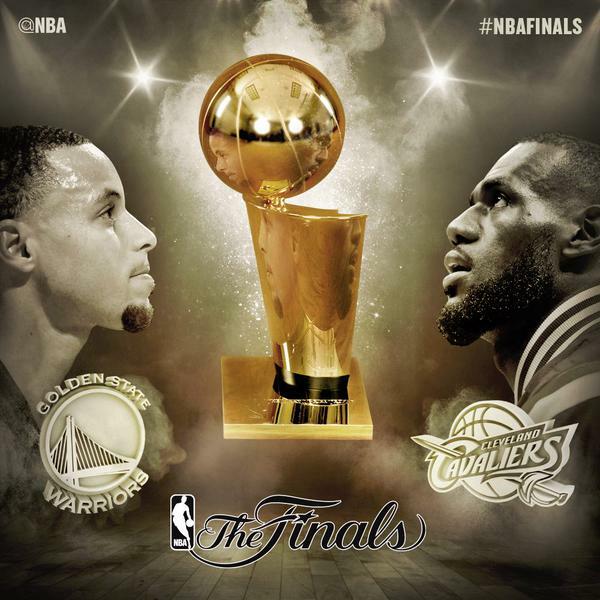 Newly crowned MVP, Stephen Curry lead his team to the finals for a best-of-seven series against King James and his Cavaliers which commences on Thursday, June 4, 2015 at 9:00 pm ET (Friday, June 5, 2015 9:00 am Manila Time). The Warriors topped all teams with an excellent 67-15 season record and just few games shy compared to ’95 – ’96 Chicago Bulls’ 72-10 win-loss record with Steve Kerr, Golden States’ current Head Coach on the Roster along with the greatest Big Three of all time: Michael Jordan, Scottie Pippen and Dennis Rodman. The Cavs, on the other hand has the 2nd best record in the East 53-29, right next to Atlanta Hawks whom they swept in their own conference’s finals. Playoffs-statistically speaking, Golden State has a slight advantage over Cleveland in four aspects: FG% 46.0 – 43.6; 3P% 38.0 – 35.9; AST 25.1 – 18.9 and; STL 8.0 – 5.8. While the Cavaliers has a slim edge over the Warriors in these departments: REB 46.9 – 46.2; BLK 6.9 – 6.1 and; TOV 12.3 – 15.3. Cavs were plagued by injuries as early as the first round. Shooting Forward Kevin Love broke his shoulder on Game 4 against the Boston Celtics. Kelly Olynyk accidentlly pulled Love’s left shoulder when the two got entangled in battle for a loose ball. Love immediately rushed himself to the dugout for further evaluation and was later diagnosed with a dislocated shoulder that sent him out for the rest of the post-season. All-Star Guard and former Top Draft Pick Kyrie Irving injured his knee during their Game 1 against the Hawks and was advised by the team physicians to take a breather for couple of games. He went back and played Game 4 where they closed out the series. Iman Shumpert has been nursing his groin injury from the start of the Eastern Conference Finals. Cavs’ 1st-string Center, Anderson Varejao is still out with a torn Achilles. Cavs’ medical team released an official statement that Varejao will still remain in the sick bay and will continue his rehabilitation. Head contusion almost kept the reigning MVP, Steph Curry out of the series when he was accidentally cut under the rim by Trevor Ariza and fell really hard on floor head first. He was cleared and played Game 5 where they shut the Rockets out. Klay Thompson, one of the splash brothers sustained a serious concussion when he was accidentally hit by, again, Trevor Ariza with a flying knee to head off a 3-point fake. Thompson fell on the floor and felt dizzy. Warriors’ doctors haven’t cleared Thompson yet but Coach Kerr crosses his fingers that his other killer-shooter will play in the finals. Obviously, the Cavs have this advantage. The Cavaliers, under former head coach Mike Brown faced the San Antonio Spurs in 2007 finals where the young Lebron James and Anderson Varejao suffered a rare finals sweep. Lebron James stayed in Cleveland for two more years before he moved to South Beach and teamed up with Dwayne Wade ansd Chris Bosh for 4 years and won 2 championships. James made a decision to return to Cleveland. This year is Lebron’s fifth straight trip to the finals along with other ex-heat Mike Miller, James Jones and Shawn Marion. Back-up Centers Brendan Haywood played with the Mavs when they beat LBJ in the 2011 Finals while Kendrick Perkins had a ring when he was with the Celtics and experienced another Finals appearance in Oklahoma Thunders against Lebron James and the heat in 2012. Surprisingly, none of the Golden State Players have any Finals experience prior to this event. Being the top seeded team during the eliminations, The Warriors take the home court advantage with 4 home games and 3 away games. But, the Cavs are looking great in all of their away games. They humiliated the Hawks in their home turf with 2 wins and finally ousted them into contention at the Quicken Loans Arena in Cleveland Ohio. Both teams deserved to be in the finals. No doubt. Golden State will keep its very strong asset, its 3-point shooting prowess from the splash brothers: Stephen Curry and Klay Thompson (if he will be cleared to play in the finals). It would be nice to see Kevin Love join the 3-point shooting party versus the splash brothers. But his services will be missed by the Cavs. On a brighter note, ex-Knicks JR Smith and Iman Shumpert are filling-in Kevin Love’s shoes. Don’t forget Mike Miller and James Jones on the bench who are both known and well-respected in the rainbow territories and former 3-point shooting champions. 4-time MVP, Lebron James will bring his A-Game in the finals. James has evolved his game since he turned pro in 2003. Maturity honed James to be a well-rounded athlete. He’s plainly unstoppable in the paint. He’s too shifty and strong inside the shaded area. I can only see Andre Iguodala guarding James in behalf of the Warriors but Iggy is too small and too slow for James. Limiting James in the rainbow arc is the only way to neutralize him. Cleveland has a deeper bench compared to Golden State. Everyone is impressed how Matt Dellavedova plays. The Australian point guard really played well during Kyrie Irving’s absence. Leandro Barbosa on the other hand, played good basketball since the post-season kicked off. Mike Miller, James Jones, Kendrick Perkins, Brendan Haywood and Shawn Marrion can form Cavs’ second unit. They might be past their primes but their championship experiences made them ahead of the other team’s bench. Front court battle will be too close to call. The tandem of Andrew Bogut and Festus Ezili against Cavs duo Timofey Mozgov and Tristan Thompson. Let the post season stats talk: REB: 46.9 – 46.2, Cleveland. BLK 6.9 – 6.1 in favor of Cleveland again.